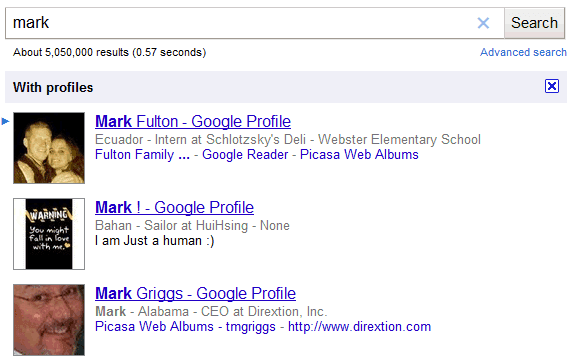 Google has a new specialized search engine for searching Google Profiles. It has a better interface than the regular Google Profiles search feature, it's integrated with Google Search and it shows additional links from people's profiles. This feature is not yet enabled in the interface, but you can search Google Profiles by adding &tbs=prfl:1 to a Google Search URL. Here's an example. Google could use the data from user profiles to provide advanced search features like restricting profiles to people who lived in Chicago, attended Long Island University and are interested in sports. Interestingly, Google tells me that "[My] profile is not yet eligible to be featured in Google search results", yet there I am on the first page when you search for my name*. *Done in an incognito window, so as not to use my regular Google session, but on the same PC, if that affects the results. Have you noticed this one? I do not really understand the purpose, but it is there and it is called "Translated from foreign pages". Nice bug, according to Google I'm now "chief editor at Google". Interresting move. Is Google preparing "Google Me" coming ? Now how can this be used to have a profile show where now there is none?? I can sense that Google me and Google +1 and Google Emerald or what ever the code name is now is probably nearing its launch date.